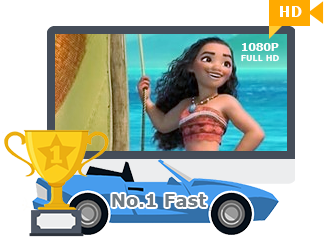 It empowers you to convert 4K HD videos, download YouTube videos, record screen, edit videos. 180+ formats supported, 83X faster speed. 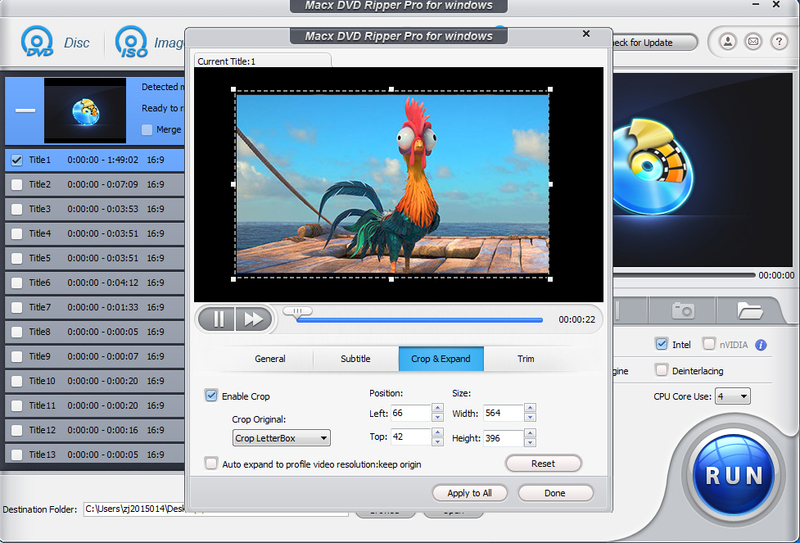 MacX DVD Ripper Pro for Windows is enhanced with latest hardware acceleration technologies to make you backup DVD to ISO/hard drive, rip DVD to MP4, FLV, MOV, MPEG, AVI, WMV, etc for iPhone XS/XS Max/XR/X/8/8 Plus/7/7 Plus/SE/6S/+, iPad Air 2, iPad Mini 4/3/Mini with Retina, The new Apple TV, Android, HTC 10, Samsung Galaxy S8/S7/S7 edge, Galaxy Note 8/7, WP8, Surface, etc up to 300-400 FPS. 5 minutes to finish a 2-hour DVD movie. 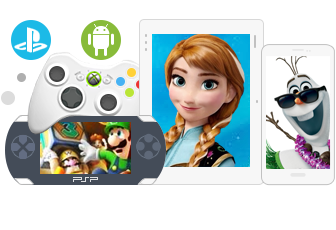 This DVD ripper software gives you full control on any DVDs, be it the newly released DVDs, DVDs with 99 titles, workout DVDs, Japanese DVDs, damaged DVDs or unplayable DVDs. Updated! Intel QSV & NVIDIA® CUDA™ Supported! World's No.1 Fast DVD Ripper to Rip DVD in 5 Minutes. 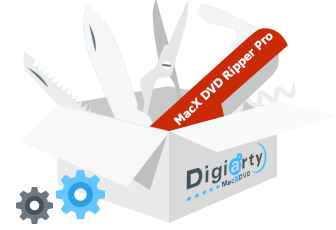 MacX DVD Ripper Pro for Windows is not only rip a DVD into any video format I want, but it can also rip straight to iPhone, iPod, Apple TV, iPad and PSP-friendly formats. This is particularly handy since other popular programs required to use third party software. I do like to feature of copy DVD, it make sense when I backup my DVD collections to my USB. To my surprise, the output video looks the same as the original one, yet the conversion only took me eight minutes. But it would be more great if it could add the ability of copying DVD to DVD. 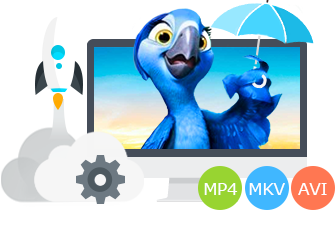 MacX DVD Ripper Pro for Windows is the best ripper software which can freely rip and convert any new copy-protected DVDs to various video formats (MP4, MOV, MKV, AVI, etc) and portable devices with original quality. To make sure you could put your favorite DVD movies in your pocket for playback anywhere and anytime, this DVD ripper has 370+ ready profiles for portable devices and is able to rip DVDs straight to iPhone XS/XS Max/XR/X/8/8 Plus/7/7 Plus/SE/6s/6s Plus/6/5S/5C, iPad/Air 2/Mini 4/Mini with Retina, iPad Pro, iPod/5, Apple TV, Android, HTC Desire 816, Samsung Galaxy S8, Galaxy S7/S7 edge/S6 edge+/5/4, Galaxy Tab S, Galaxy Note 8/7/4/Edge, Google new nexus 7, PS4, Surface Pro 3, Xperia Z4/Z5/C4/M4/XZ/X Compact and other popular mobile phones and tablets. Almost all DVD rippers get stuck when ripping the latest DVDs. These issues with DVD backup such as software crashes no longer exists in MacX DVD Ripper Pro for Windows. Uniquely, the rebuilt DVD analysis algorithm and title check mechanism help to access all the intractable discs now, ranging from 99-title DVDs, newly released DVDs, TV series DVDs, workout DVDs and even those damaged DVDs. 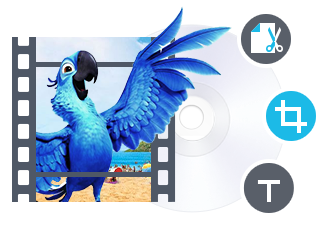 The DVD copy feature allows you to backup DVD to hard drive in ISO image and DVD folder without cutting down the quality during the DVD backup operation. 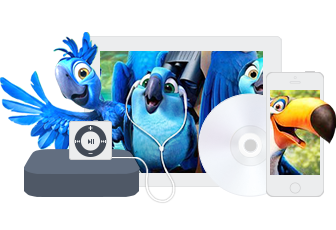 It allows you to copy full /main content of DVD to MPEG-2 file with lossless video quality and 5.1 Channel AC3/DTS Dolby audio. It only takes 5 min to complete the copy process of a 2-hour DVD movie on Windows 7/8/10. With this DVD ripping tool for PC, You can access all available editing functions to trim, combine and crop your DVD movie. You can create a custom clip from a larger scene to adjust the duration of your clip by trimming. The crop feature helps you cut off the black edges you don't want to keep. Combining some of video clips into a single video can be achieved by merging. It also leaves up to you to select subtitle track (incl. forced subtitle ) and attach external .srt subtitles to the movie. 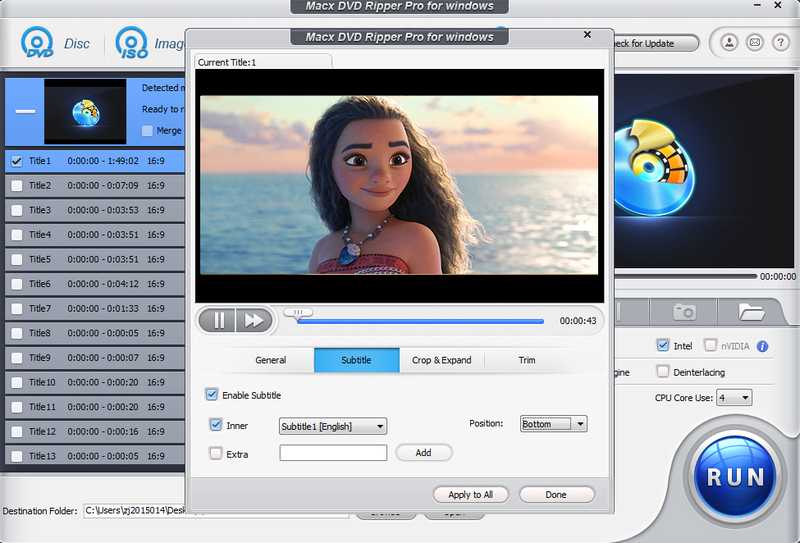 MacX DVD Ripper offers a decent level of control over parameter setting. 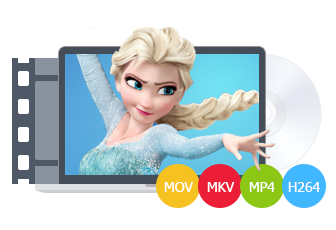 Lots of customized options are provided so that you can adjust the aspect ratio, reslution, video codecs, bit rate, audio parameters .etc for making personalized videos. This DVD ripper for Windows is designed for maximum efficiency and ease of use. Enable the Hyper-Threading and Muliti-Core CPU on PC, it will fruther speed up the ripping without affecting on routine computer activities. Check the Safe Mode and Deinterlacing, it will deal with tough discs and improve the output quality. It is featured for Intel Quick Sync Video and NVIDIA CUDA graphics acceleration technology, promoting the DVD ripping process, up to 300-400 FPS, 2-4X faster than other DVD rippers. The multi-core CPU utility and hyper threading technology help to maximize the speed as well. Thus, you can rip a 120-min DVD movie in only 5 mins while getting a good-looking video with no quality loss. Generally, it is difficult to balance the video quality and file size. But this DVD ripper for Windows make a perfect balance between them. The default setting for each output format will help you to maximize the output quality. The "High Quality Engine " and "Deinterlacing" are also designed in this DVD ripper to ensure highest possible output quality with desired file size. 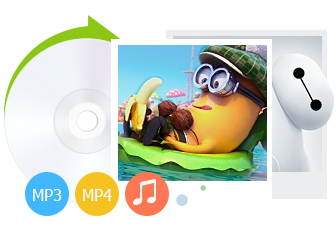 With this DVD ripper, it is easy to extract background music from the DVD file and rip DVD audio to MP3 audio format with high quality. An option is also offered to those who would like a copy of the favorite scene in the DVD movies for making wallpapers.